Bangladesh all-rounder Shakib Al Hasan’s Kolkata Knight Riders (KKR) booked a spot in the four-team play-off round of the Indian Premier League (IPL) with a 22-run win against Mustafizur Rahman’s Sunrisers Hyderabad at Eden Gardens, Kolkata on Sunday. 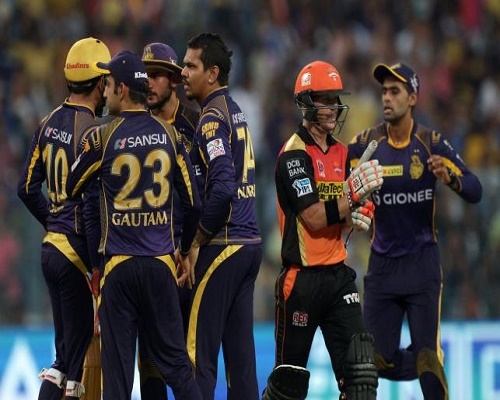 KKR hold the 3rd slot after the first round collecting 16 points from 14 matches with eight wins and six losses while Sunrisers, the side confirmed their play-off berth earlier with one match to spare, placed 2nd by virtue of more net run rate also collected identical points and win loss records. Gujarat Lions top of the list with 18 points from 14 matches, including nine wins and five losses. In the day’s match, chasing a target of 172, Mustafizur’s Sunrisers finished the innings at 149/8 in 20 overs with opener Shikhar Dhawan’s half century of 51 runs. With the day’s 1/34 and 7 runs for KKR, Shakib bagged 5 wickets for 243, playing 10 matches in the first round, while with bat he scored a total of 114 with the best 66 runs. Sent in to bat first, KKR scored 171 for 6 in 20 overs spurred by Yusuf Pathan unbeaten stand for 52 runs. Manish Pandey was another notable scorer with 48 runs. Satkhira’s young lad Mustafiz conceded 32 runs in his four-over spell for one wicket. The “No-Run No-English”, tagged in IPL, Mustafiz captured 16 wickets for 356 runs from 14 matches with best 3/16 and at average 22.25 and economy rat 6.71. In terms of having most dot balls in an innings, Mustafiz placed 2nd as he got 17 dots off 4 overs, after Gujarat Lions bowler Dwayne Smith 18 dots off 4 overs. Man of the Match: Yusuf Pathan.